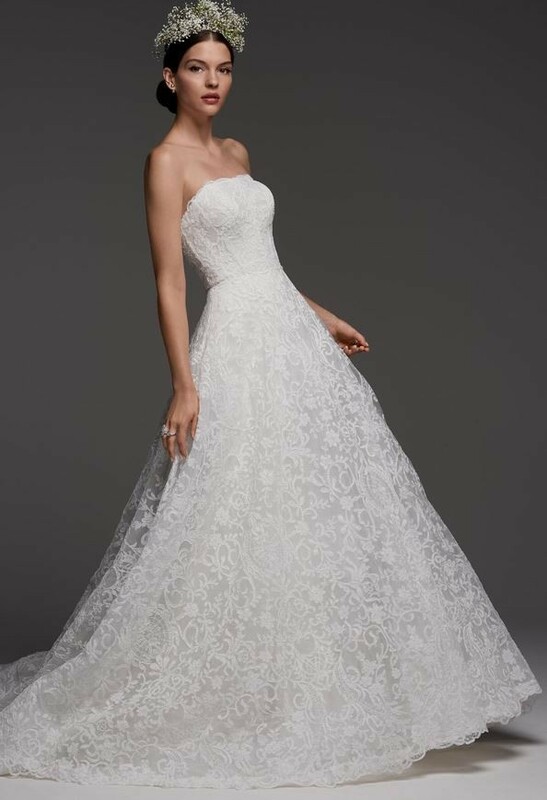 From the designer: Hand placed Muscovy Lace is layered over Dotted Netting and Tulle, lending to a timeless and classic ball gown fit for royalty. The quintessential "bridal" dress. I searched high and low to find a dress that was unique and modern yet classic. After trying on +200 dresses (no joke) I settled on the Grimaldi by Watters and purchased from the Downtown Nordstrom Bridal Suite in Seattle. The dress is a slimming A-line with enough volume and train to still make an impact. The seamstress at Nordstrom was a magician and also made the most beautiful bustle (yes, I may be somewhat biased...) with easy to use but nearly invisible hooks added. The only other alteration made was to take in the bodice slightly and add additional support (essentially like a built in strapless bra) so that there is no way the dress can budge once done-up. The length was not altered whatsoever so the lace detailing at the bottom is still fully intact. Dress has been professionally dry cleaned and carefully packaged. Please let me know if you have any questions.